The TI TMX320C DSP IC. Icom has released in advance the news about the new IC-7800 HF/6m transceiver. In a preview at the 2003 Dayton Hamvention (May 16 – 18 2003), the company unveiled the HF/50MHz Transceiver's prototype and the Pre-release Product Information. They also declared: "Icom brings you the most advanced amateur radio ever in the IC-7800!" 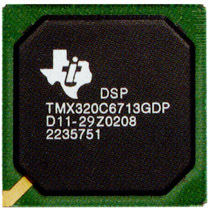 The preliminary IC-7800 Product Brochure emphasised the utilisation of the new Texas Instruments DSP chip (TMX320C6713GDP), which was in prototype development at the time of printing. However, on August 19, 2003, TI presented the TMS320C6713 Floating-Point Digital Signal Processor datasheet on their official site. Thus, there are now no more doubts about the chip's availability, and Icom is ready for IC-7800 production. The TMS320C6713 (C6713) device is based on the high-performance, advanced VelociTI™ very-long-instruction-word (VLIW) architecture developed by Texas Instruments (TI), and with dual fixed-/floating-point multipliers up to 450 million multiply-accumulate operations per second (MMACS)." The IC-7800 builds on the phenomenal performance of the 32-bit DSP that Icom introduced. Thanks to the 24-bit AD/DA converter, it supports many DSP features that come from Icom's experience with the IC-756Pro and IC-756Pro II. Note that Icom still uses the ADI SHARC DSP IC (as found in the IC-756Pro/Pro II) in the IC-756Pro III. The Texas Instruments TMS320VC33 DSP was first introduced in the IC-746Pro (IC-7400), and Icom may be using it in HF marine and PMR radios. TMX Definition: Texas Instruments (TI) does not warranty either (1) electrical performance to specification, or (2) product reliability for products classified as "TMX." By definition, the product has not completed data sheet verification or reliability performance qualification according to TI Quality Systems Specifications. The mere fact that a "TMX" device was tested over a particular temperature range and voltage range should not, inany way, be construed as a warranty of performance. TMP Definition: TI does not warranty product reliability for products classified as "TMP." By definition, the product has not completed reliability performance qualification according to TI Quality Systems Specifications; however, products are tested to a published electrical and mechanical specification. TMS Definition: Fully-qualified production device. All trademarks are the property of their respective owners. Copyright © L. Gentili 2003 All rights reserved. Last revised: June 15, 2018.